When it comes to self-defense, you need knock-out power that your fists may not be able to deliver. If you feel vulnerable, carry a stun gun. Some parts of town always feel safe, but if you are in the wrong place at the wrong time, you want to know you’re ready if trouble arises. The best stun guns offer you the peace of mind you should always have, but also the protection you hope you never need. The problem is, just about every product promises a ‘’powerful punch,” so how do you know what is good and what is going to let you down? Our rundown of the best stun guns for self-defense includes only reliable, effective, top-rated products. The Viptertek is more than just a stun gun. 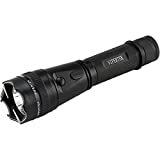 It is one of the best flashlight stun guns. This stun gun is a serious piece of equipment with its LED flashlight. The rechargeable battery means you won’t need to stock up or hope that they still have enough juice to keep you safe. The mere presence of this stun gun is enough to make most attackers turn and run. The sound it makes is loud and intimidating and will serve as the first line of defense in many situations. What you need to know is how strong the current is. At 53 billion mini volts, it delivers a real shock to any attacker. The stun gun includes a safety switch that prevents you from shocking yourself. The top edge is useful for breaking through a window should you find yourself trapped in a vehicle or need to rescue someone from theirs. The heavy-duty aluminum alloy materials make it sturdy and able to withstand every day falls to the ground. The solid materials also serve as another line of defense as a blunt instrument. Although the flashlight might sound like it is there to serve the design, it works well and is strong enough to rely on in poor lighting. The Vipertek VTS-195 is not so heavy that it weighs you down, but the company builds it to last, and it is much more of a deterrent than anything that can fit in your purse. The company includes a lifetime warranty with every purchase. The warranty, with the rechargeable cord, makes it a good option both in cost and self-defense. The VTS-881 is another option from the reputable company, this time their condensed version. It comes with another LED flashlight and a variety of color options. But style comes after substance here, and luckily for anyone interested in this stun gun it has plenty of style too. It has 35 billion microvolts that are more powerful than many full-size alternatives. At only 4 inches tall, the stun gun fits easily into your pocket. The small size doesn’t limit its powerful performance. The rubber coating means it is less robust than the previous product, but it does mean it won’t slip from your palm when you are holding it. Like the VTS-195 it comes with a lifetime warranty. And once again, it is rechargeable. Safety doesn’t have to hit your wallet as hard as you might think. The stun gun does come with a holster, but in most situations, it isn’t likely that you’ll use it. Vipertek seems to have condensed their other designs into this one. Creating a stun gun that can fit in your pocket yet still deliver a real kick when you need it to is a great idea and is already becoming a definite favorite with many people. I love this device and now carry the test model everywhere, one perc of the job! The Sabre is the final product in our best stun guns list, but it is a heavy-duty option. 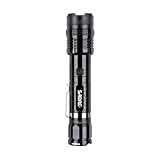 Like the other stun guns on our list, the Sabre also has a flashlight. The 80-lumen LED has 3 settings including a stronger light, lower light, and strobe. As with a lot of Sabre products, it is built to last. The aluminum construction means it feels sturdy and can withstand the punishment it deals out. The loud crack it delivers serves as a real warning that has been known to send dogs running and put off would-be attackers before any physical contact. You will find that it is easy to get your hands on when you need it the most. The handy belt clip means it is never far away. The 1.139 micro-Coulombs is some real voltage that ensures your safety! The Sabre company has been operating for more than 40 years. A brand with such longevity is something to be admired. While the hope is that you will never need a stun gun, it is always reassuring to know that if a situation arises, you have the means to defend yourself. 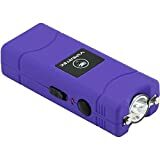 These stun guns have their own merits and suit different lifestyles, whether you need a stun gun with a flashlight or just something that fits in your pocket. All of the above are superb quality, and concerning efficiency and reliability it will be hard to find anything that compares. Remember to research the proper way to use a stun gun before you carry it with you. Research is the best way to ensure that you can keep yourself safe.